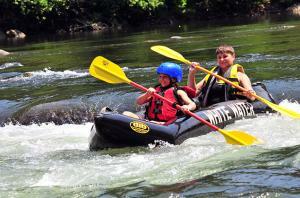 Have a mild or wild water adventure in the Laurel Highlands. 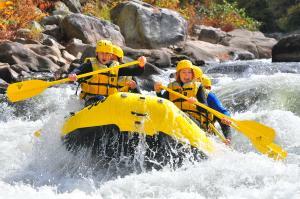 Rafting tours are available on Class I through Class IV waters. You can paddle your way down a leisurely stretch of flat water while enjoying the view with your family, or challenge yourself with some of the best kayaking and whitewater rafting in PA. Stand up paddle board on calmer waters, take a leisurely lake paddle, or prepare yourself for the thrill of the whitewater. The heart of the fun in the Laurel Highlands is the fast-flowing Youghiogheny River, which attracts whitewater boaters from spring to early fall. With Class III and IV rapids, the seven and a half mile Lower Yough is the busiest section of whitewater east of the Mississippi River. But you don’t have to be an experienced paddler to join in on the adrenaline-pumping fun. The section known as the Middle Yough features Class I and II rapids, making it ideal for novice kayakers, families with young children, and anglers. Climb on board an express trip for a shorter ride down the river that doesn&apos;t take up the whole day, or jam-pack an entire weekend with fun on water. Your guides have all the gear and know-how to make your whitewater rafting adventure in PA&apos;s Laurel Highlands a success! Experienced outfitters can prepare you for the level and intensity of rafting that matches your desires and experience levels. You’ll find extensive rafting, kayaking, and canoeing options, and be amazed by the beautiful surroundings you’ll encounter while on the Yough. The Bottom Yough, Middle Yough, and the Youghiogheny River Lake are perfect for more leisurely family floats. The Bottom Yough and Youghiogheny River Lake are very calm, while the Middle Yough offers Class I and II rapids, just fast enough to excite the kids. 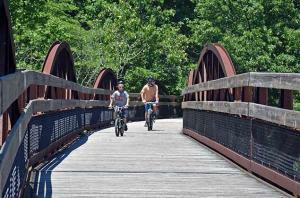 Experience a day full of biking, boating, and exploring in Ohiopyle! Take advantage of Ohiopyle Trading Post&apos;s and Wilderness Voyageur&apos;s Pedal-Paddle package and pack in biking and rafting in one day of fun. Pedal upstream and exchange your bicycles for boats so you can float and paddle back to Ohiopyle. 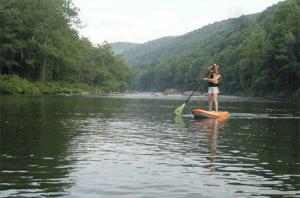 There are dozens of locations across the Laurel Highlands where you can paddle out. The main hubs for rentals are in Ohiopyle and at Laurel Hill State Park, but there are plenty of locations where you can bring your own equipment as well, like the Casselman River, Pasternak Recreation Area, Mammoth Park, and Northmoreland Park, just to name a few. In Ohiopyle, take some of the best kayak instruction programs, designed for every level of experience. Beginners start on the flat water, intermediate paddlers can tackle the Middle Yough with Class II rapids, and advanced kayakers can take on the Lower Yough, with its Class III and IV rapids. On the Bottom Yough with Class I waters, you&apos;ll find Hazelbaker&apos;s Kayak & Canoe Rental, where you can rent canoes, kayaks, rowboats, hydro-bikes, and paddleboats. Stand-up paddle (SUP) boarding is an increasingly popular way to enjoy the water. With more mobility, a short learning curve, and more freedom, you’ll be paddling down the river in no time.You can rent the boards in Ohiopyle at Wilderness Voyageurs or at Laurel Hill State Park, where you&apos;ll find Hazelbaker&apos;s Kayak and Canoe Rental&apos;s second location. 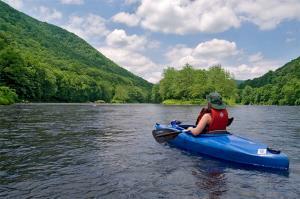 Plan your water adventure today, and enjoy the beauty of the Laurel Highlands!